I had the disctinct pleasure of seeing The Octopus Project live in concert the other night. For those of you not familiar with this group, I can best describe their style as "eclectic/electric noise march". A quick listen to Ghost Moves on the album Hello Avalanche should explain what I mean. Their show is full of energy, creativity, and of course, theremin! 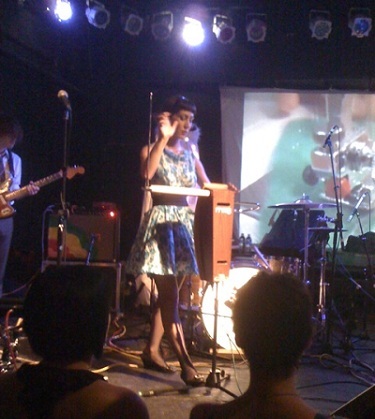 Among other instruments (keyboards, guitar, synthesizers, and xylophone), thereminist Yvonne Lambert plays a Moog Etherwave Pro front and center on several songs during the show. Depending on the song, she either plays haunting melodies that bring a Zen-like balance to the thrash of the guitar, drums, and synth loops, or she adds to the fun with effects-laden sound effects. I was particularly impressed with Ms Lambert's spot-on tune. I didn't notice her using a pitch preview at all, but she started each of her lines with pitch-perfect accuracy seemingly out of nowhere! 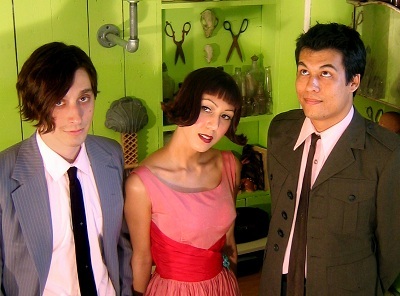 The Octopus Project is currently winding their way across the United States on tour to promote their new EP, Golden Beds. You can find their full tour schedule on the band's website. Catch them while you can!